Also known as Myrtle, and an extremely popular evergreen groundcover. 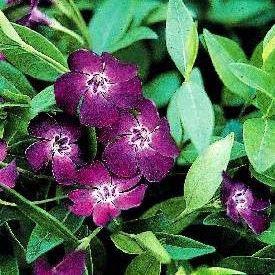 This less common selection forms a dense mat of glossy dark green leaves, studded with deep wine-purple flowers in spring. Very shade tolerant, the leaves will sometimes scorch in too much sun. Tolerates dry shade once plants are established.